If you’ve been following me so far, then you know we have some patterns emerging. White was full of humans and exile effects. Blue had a decent number of zombies and spirits, and tempo spells. Black had zombies, vampires, and kill spells. Now we come to red. What do you expect to see from this color? If you say burn spells, vampires, and wolves, you’re not far off. 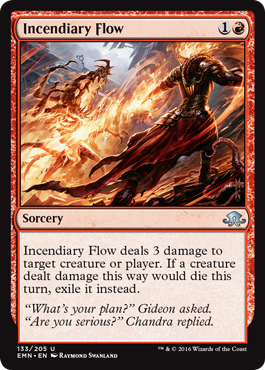 Red continues to push the the tribes of Innistrad hard, and there are better burn spells in this set than we’ve had in a long time. In the past we might have had some cards that broke the color wheel, but with SOI and EMN it looks like the colors are back firmly in their domains. Before checking out my red picks, be sure to see what I talked about in my article for Shadows Over Innistrad red cards. Now that’s just nasty, and I don’t mean the picture on Smoldering Werewolf’s transformed side. GR werewolf decks tends to be aggressive, and it forces your opponents to block often. This means they’ll be double blocking and from time to time leaving their blockers on the verge of death. Smoldering Firewolf finishes them off, and also deals with all of those pesky 2/1 and 1/1 flyers pretty easily. I see no problem in flipping it on time either, and if you can keep the board clear of blockers Erupting Dreadwolf can easily turn into 8 damage a turn. The toughness on both sides of the card might make using him a little weak to most forms of removal, but I think it’s a great card to take early in draft. Not first pick worthy, but something you want to grab as soon as possible. 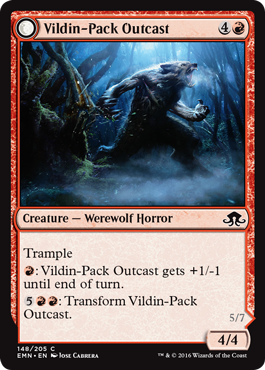 Vildin-Pack Outcast takes a little more work to flip, but it becomes a great finisher when it does. If you have the 7 mana to flip it, then you shouldn’t have any problems attacking with a 12/7 creature with trample the next turn. Its transformed side makes me really want to play this card in limited no matter what. I wouldn’t go as far as to say it’s first pickable, but you don’t often find red creatures with trample at common, and especially one that lets you turn it into a deadly 7/1 glass cannon if unblocked. If you need a beater for your deck, play this card. 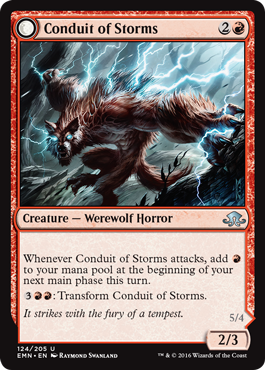 At 2/3, attacking shouldn’t be that big of a problem for Conduit of Storms, especially if you play it on turn 3. If you hit your land drops and play him early, I don’t see any problems flipping him into Conduit of Emrakul on turn 4. The extra mana you get from attacking makes him kind of dangerous early on. Not only does he become a nice beater once transforming, but he also seriously speeds up your next few turns with the extra mana he produces. Giving you 7 mana in your second main phase on turn 5 is huge. This is a card I’d want to have 2-3 of if I was playing a few Eldrazi, if only to get them into play as early as possible. I wouldn’t call him a limited all star, but I don’t think you should overlook his potential as a pseudo-mana dork and beater. I’d grab 1-2 early in draft and be happy with that decision. 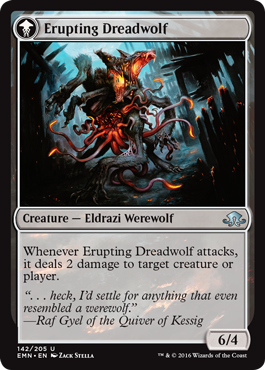 I really like this card in a devoted GR Werewolf deck, especially if you have Howlpack Resurgence. That enchantment is only going to make this archetype better now thanks to the new influx of wolves and werewolves. A 4/3 attacker for 3 mana is solid, but if you can turn it into a 5/4 trample with minimal investment AND as a combat trick (Resurgence can be played with flash), then I think this will be one of those red deck staples. It’s not a high pick in draft, but I think it will make the cut in people’s deck more often than not. This type of ability would have been better during the BFZ/OGW limited format to tap down those pesky man lands, but in SOI/EMN limited it could have its uses. There probably aren’t too many lands you’d want to tap down with it other than Hanweir Battlements, but think of it more as a tempo play. 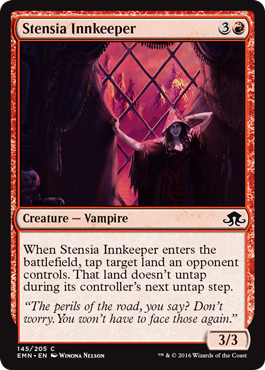 In a tempo heavy UR deck you could bounce one of your opponents cards then play Stensia Innkeeper to deny them the resources they need to recast it. Pretty neat effect, but probably not highly sought after in most limited decks. A 3/3 for 4 mana still isn’t bad though. There are quite a few of them in this format. It looks like “Hill Giants” are finally getting their day. I’m torn whether or not to feature this card, but the fact that it has trample won me over. I found myself unable to consistently activate madness effects during SOI limited because other players always seemed to get the good discard outlets. Furyblade Vampire is slightly better than Ravenous Bloodseeker. I’m not sure if you can discard multiple cards to it at the beginning of your combat step (it would be bonkers if you could pitch your hand and get +9/+0), but even if you can’t having a 4/2 trample for 2 mana isn’t bad. UR and BR madness are obvious fits, but its ability could also be used for delirium effects. If you need some two drops to lower you mana curve, there are worse choices than Furyblade. Just like Furyblade Vampire, I was conflicted as to whether or not to talk about Weaver of Lighting. Like Furyblade, that extra ability sold me on it. 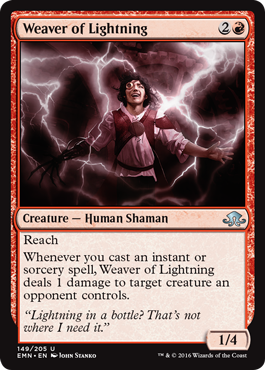 Weaver of Lightning is a good card against the dozens of flyers in SOI/EMN limited thanks to reach, which is strange to see on a red creature. Most decks will only play 5-6 instant or sorcery spells in limited though, which means you won’t get to use his ability that often. Therefore, I’d recommend him for those decks like UR Tempo or BR madness. Being able to add a point of damage to a Fiery Temper or Reduce to Ashes could mean the difference between winning and losing a game. It’s especially powerful against blue decks that have a large number of 1 toughness flyers like Stichwing Skaab or Rattle Chains. The incremental damage could really swing the game into your favor. It’s no Inferno, but being able to take out multiple creatures with one card is always good. I’d expect this card to kill 2-3 creatures consistently. Two 3 toughness, or 3 with toughness ranging from 1-3 are all likely scenarios in this format. First pickable? No, but a high pick for anybody playing red, especially in GR or UR where burn is your best buddy and pretty much your only removal. Not quite Incinerate or Pillar of Flame, but a nice balance between the two. It’s been a while since we’ve gotten a 2 mana burn spell that does 3 damage to either a creature OR player, and adding an exiling effect is just icing on the cake. Don’t let the sorcery speed fool you. This is amazing card in limited and will be a very high pick in draft. Good burn is hard to find. While the rare Escalate spell will probably overshadow Savage Alliance in standard, it in no way diminishes the destructive potential of it. For 5 mana you can wipe your opponent’s board of all tokens, deal 3 to one of the bigger ones, and throw an unstoppable force in your opponent’s face. Keep in mind that the 1 damage diminishes your opponent’s creature’s blocking ability and makes that trample effect just that much more effective. 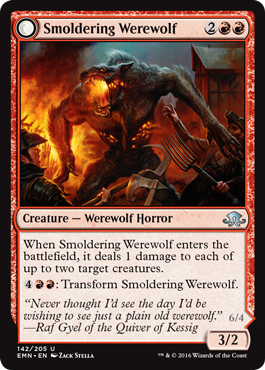 This will obviously be best in a GR werewolf deck with a lot of fatties, and I think it would be a shame to decide against not playing it in just about any other red deck. 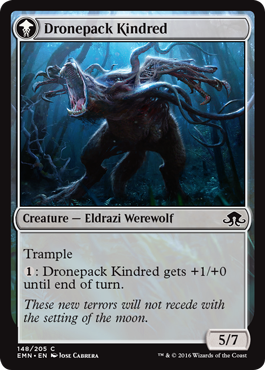 This is definitely one of those suicide cards like Skin Invasion where you want your creature to die as soon as possible, and just like Skin Invasion you could play it on either your own creature or an opponent’s. Making a creature with an attached Skin Invasion attack you then casting Otherworldly Outburst on it after you block to kill it to get two 3 power creatures is mean but so sweet after combat damage resolves. Good in tempo decks or decks trying to be aggressive. If your opponent has tons of removal, also a good card to side in to get good value from them. If removal has dried up in your draft pool, pick this up. Nice! 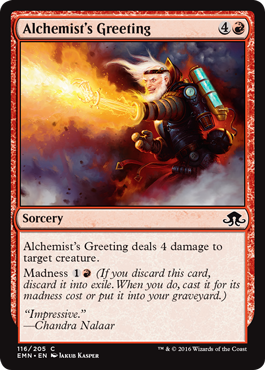 The regular casting cost of Alchemist’s Greeting is fair, but it’s madness cost is insane. Two mana for 4 damage in a devoted UR or BR madness deck is really good. Definite staple for madness strategies and not easy to cut from other red decks in sealed. Four damage is much better than 2 or 3 in this format. Blood Mist – While I think this card has a very strong effect, I’m hard pressed to see when I would play it instead of another removal spell in limited. If you have lots of evasion and skulk creatures, it might be good. Deranged Whelp – Menace on a 2/1 is good, and it will certainly see play in GR werewolf decks. It has a lot of competition in the 2 drop spot though. Galvanic Bombardment – better in draft when you can get 2-3 in your deck. Not so strong in sealed. Insatiable Gorgers – somewhat of a glass cannon which makes it a liability. It will trade with whatever blocks it most likely, but also can leave you wide open if you’re not careful. Prophetic Ravings – If you’re looking to overload on discard outlets for madness effects Ravings will do the job well. But just like Blood Mist, I’m not sure what I’d drop for it instead. Stensia Banquet – Good to the last drop :). 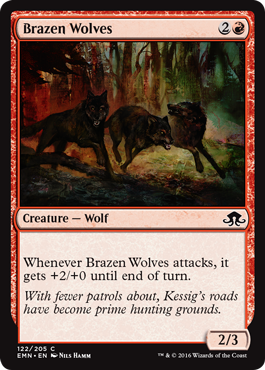 Just like the wolf based card that predated this, Stensia Banquet is great if you are able to draft or open a sealed pool with lots of vampires. Otherwise it’s ‘meh’, even with the draw a card addition. Thanks to red and black, you should have no problems finding a way to discard your madness cards and cast them for cheap. Whenever you see a card with a “discard” ability on it, you can bet on your opponent having a combat trick to throw a surprise blocker in your path or kill a creature. I also expect GR Werewolves to be twice as aggressive as last time. Be sure you’re packing a few removal spells, be it exiling, kill, or burn effects. While Eldritch Moon adds a few good vampires to the mix, I feel like that tribe is slightly less powerful than humans, werewolves, and spirits (though I could be wrong). They have bigger flyers than the spirits tribe, bigger bodies than the humans, and can go toe to toe with werewolves, but they also tend to cost more and be more restrictive. I’m going to stop here for red today, but if you have any other things you want to add to this article about the cards I mentioned or want to suggest a few other combinations that I didn’t talk about, please do so below. Tomorrow is the midnight pre-release, so I’ll be trying to get green out after work/FNM sometime, but I’m not entirely sure I’ll be able to post it before I head off around 11:30 pm. Keep your eyes peeled for it. Worst case scenario is that you’ll have to wait until Saturday evening Japan time (or Saturday morning for those of you in the USA). See you then! 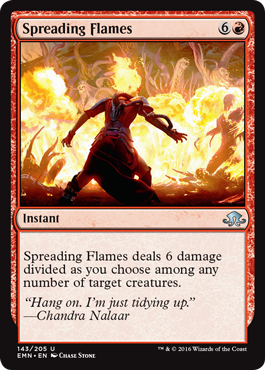 Spreading Flames is definitely first pickable! In fact there are only a couple of rates I would take over it. It has a mana cost that is difficult to cast, but the effect is really powerful and flexible. It is basically the top of your curve in a an aggressive deck or just a great late game control cardZ I think it is in the top 5 best cards in the set for limited 3.5 stars is probably correct, though. The expensive cost can be a hindrance and there a plenty of games where you can’t cast it.